Who Are Waggy Tails Perth? Waggy Tails Perth is owned by Anna and Brian Blackburn. 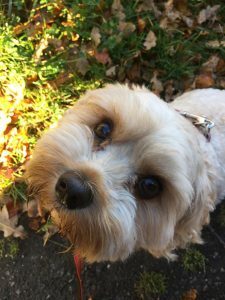 We have had a variety of doggy’s over the last thirty years, nearly all rescue puppies….but also a couple of great pedigrees along the way too, Boxers, Spaniels and Labradors, which has given us a wealth of experience and a genuine love and understanding of your dogs needs. We are based in Abernethy in rural Perthshire and service the local areas of Abernethy, Aberargie, Bridge of Earn and Perth. Anna is in charge of fun, happiness and adventures. She loves being outdoors all day, which is just as well as the dogs love that too. 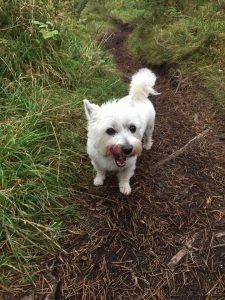 Anna plans regular rural walks in and around Perth to ensure the dogs get variety and a change of scenery, as we all like to go on new adventures including the doggy’s. Follow our adventures on Facebook, Instagram & Pinterest. We have been established since August 2016 and you only have to see what our customers say to be sure that your best friend will be in safe, reliable and professional hand. 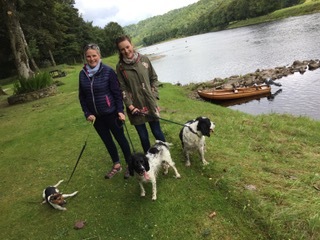 A Doggy Day Trip to The River Tay at Murthly with Froy and Monty. Christine Simmonds, Bridge of Earn Perthshire.